The Pacers and Paul George coming to terms on a 5-year $90 million extension signifies a promising future for a once-irrelevant team while affirming George’s growing stature in the league. Drafted tenth overall in 2010, George’s ascendancy from unpolished potential to premier talent has perhaps been the biggest factor in the Pacers’ resurgence. At 23-years-old, he’s an elite perimeter defender who can guard multiple positions. His athleticism and length allows him to be explosive around the rim – which overshadows his abilities as a shooter. He can fill up the box score without obtruding on his team mates but, when called upon, can hit big shots in key moments. Formerly a roster full of bad seeds and nice guys who couldn’t play, Indy’s payroll now sports three All Stars who will stay together for at least the next three years. Roy Hibbert will continue to be a defensive stopper in the paint and devour Gatorade faster than most human beings. David West, though on the wrong side of 30, will rely on fundamentals even if his physicality wanes and persist on making hilarious faces. George, however, has yet to reach his ceiling. All of the face-busting dunks and late-game heroics displayed in last year’s playoffs were merely appetizers for what looks to be a fruitful career. 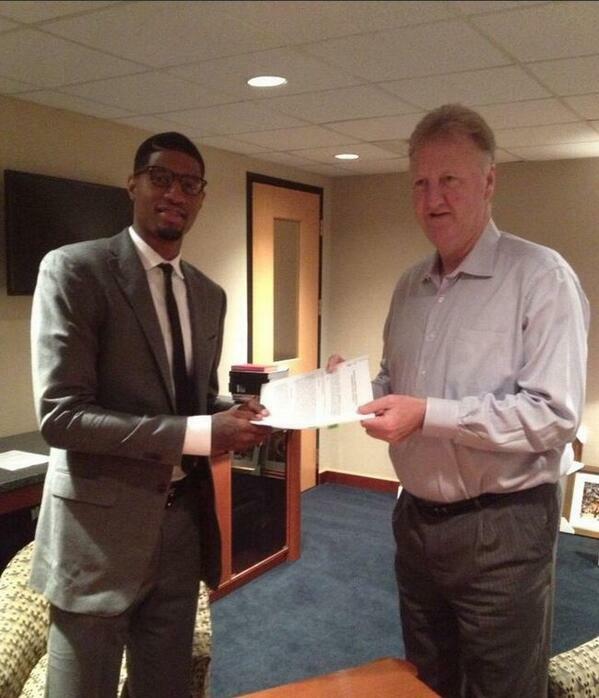 This made getting a deal done all the more prudent for the Pacers. Perpetually disadvantaged in luring marquee free agents, the only way the team can snag big time talent is through the draft and trades. George falling to the Pacers (Thanks Minnesota and Utah!) was a stroke of luck in which both sides stand to reap significant benefits. For George, his grandchildren won’t have to worry about paying for college. He can buy his parents a new home. He can take care of his mother who suffers from lingering side effects of a stroke. He can buy as many custom Xbox controllers as he pleases. For the Pacers they’ve secured a long term commitment from a top twenty caliber player who shows no signs of diminished growth, who is mature and grounded enough to understand the gravity of being the go-to guy for the team. Now the focus turns to this season. A season Bird describes as “all in” for a run at the team’s first NBA championship. Looking back, it’s hard to fathom how CBS sports could be so laughably boorish on the Pacers drafting George in 2010 while declaring the no-name Al-Forouq Aminu to be the best forward in the draft. Fast forward to the present and the Pacers are the envy of several markets in the league, including the hopeless Lakers and their despondent fans who pleaded with George to return home and rescue his hometown team. In a recent interview with ESPN’s Colin Cowherd, George commented on the incessant fervor. But George reaffirmed his desires to remain in the Circle City. Of course he can’t. George has plenty of reasons to be happy where he’s at. 90 million reasons as it turns out. This entry was posted in Uncategorized and tagged basketball, indiana pacers, larry bird, nba, pacers, pacers sign paul goerge, paul george, paul george contract, paul george extension. Bookmark the permalink.